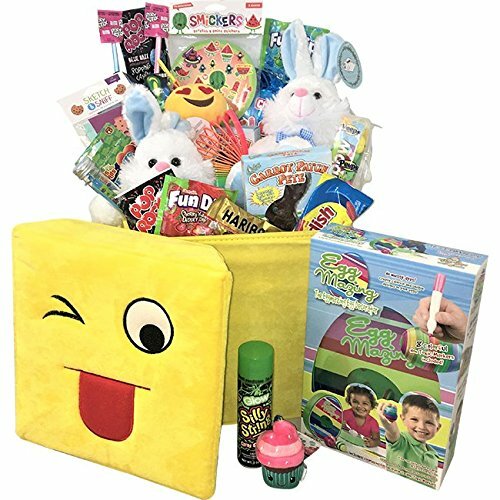 The perfect family Easter Basket - bunnies, candies and toys for everyone. The Eggmazing Egg Decorator kit - no mess solution to decorating Easter eggs. put a hard boiled egg into the machine and turn it on. The machine holds and spins the eggs. Then you hold a marker on the egg as it spins to create stripes, lines or other designs. The adorable plush emoji box is actually a collapsible storage bin and chair. After the Easter treats and games are gone they can keep it in their room for years to come. Measures 12" x 12". Scratch & sniff note pad, gel pens, and smickers for hours of fun on Easter day and beyond. We've included 2 pieces of lots of goodies - plush bunnies, chocolate bunnies, pop rocks, pixie sticks, fun dips.